Ready to feel at home in your body? Feeling the pull to know yourself and your purpose at a deeper level? Seeking a doorway to transform your life? Hi, I’m Allison, your guide along the journey of coming home to yourself. I am excited to work with people who are committed to feeling better, knowing themselves and trusting their bodies. The truth is, I am a personal-growth junkie and between my own journey and my extensive training I have a lot of expertise I want to share with you so that you can feel connected, at home in your body and find your thrive. Each session with me is one-on-one with a highly individualized treatment to support your wellness goals. You may experience unexpected positive changes as a result of regular acupuncture. Your opportunity to meet Allison, visit the space, and discuss treatment plan. The options for women’s healthcare in this country are limited. Chinese medicine contains a literal treasure chest of methods for supporting you to live life to the fullest at home in your body. You deserve to make friends with your body and move forward with strength and comfort towards your dreams and have the life you want. All genders are welcome. Hurt yourself shoveling? Skiing? Moving boxes? Slip on ice? Let’s treat that before it become chronic and you can’t participate in life the way you want to. If you have chronic pain there is much acupuncture can do to help you get back on the road to your old self and not be in constant pain. Stress, anxiety and depression are a part of being a human. While we cannot escape these feelings, it is possible to achieve greater balance and a calmer system. Working with the body can bring a greater alignment to all of the parts of our being, which makes being in the world just a little bit easier. Headaches stink and you don’t have to suffer alone. There are ways to balance your body and relieve your pain naturally with acupuncture and herbs. Maybe the days of carrying pain relievers around are numbered. Ancient Daoist healers saw how we are a part of nature and each of the elements exists inside of us as well as outside. The balance of these elements inside of us will affect our physical, mental, emotional and spiritual health. The practitioner seeks the root element that is out of balance which is often the original cause of distress. Like a tree, by treating the root, the branches are also treated. Chinese herbal medicine is a 5000-year-old formula science. That means when I prescribe you herbs they are in a formula and not single herbs. Herbal medicine is important for your long term recovery, working on a cellular level for you every day. I am committed to sourcing only safe and high-quality herbal formulas for your use. A technique that uses glass cups as suction devices, typically along the back. Muscles are able to relax, while also working the deep tissues and removing toxins and blockages. A technique that employs the burning of mugwort to facilitate healing. The mugwort is burned on (with protective salve) or above acupuncture points. This warms the acu-point and body, as well as nourishing the blood and qi. Commonly called ‘moxa’, this technique feels pleasant, like radiating warmth and is an invaluable tool. This energy medicine system uses Prana (life force) to transform and harmonize the body's energy field and chakras. A simple no-touch approach draws from the life force surrounding us to help the body repair itself. Crystals and minerals are placed on or around the body to assist in balancing the energy body. The crystals will absorb, direct and move energy as needed, helping you feel grounded and refreshed. Aromatherapy uses essential oils topically, which are then absorbed or inhaled, creating subtle changes in the brain. 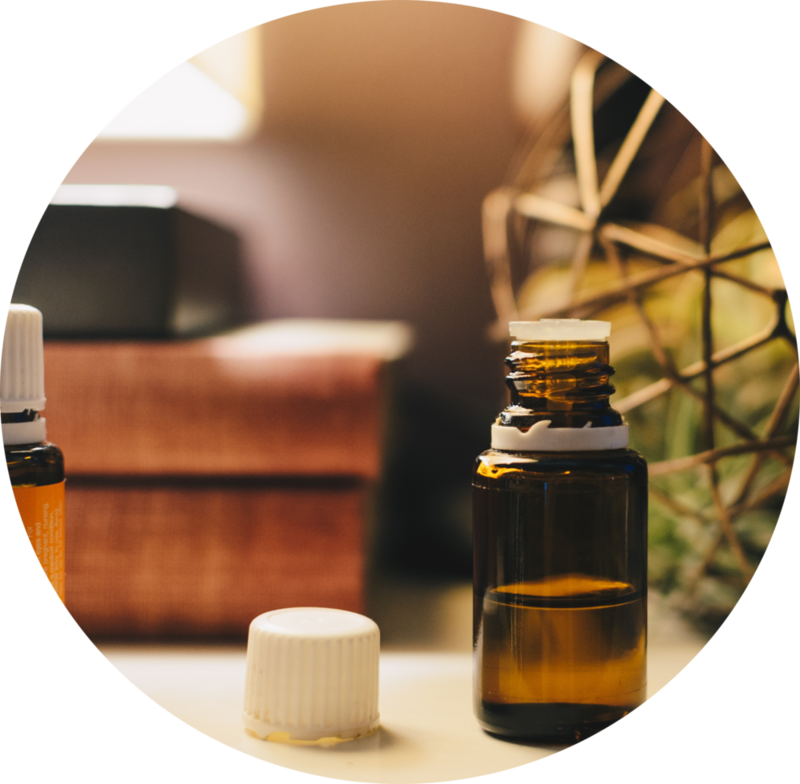 I have studied the use of essential oils to enhance acupuncture treatments and use high-quality essential oils in the practice. Tuning forks are activated and then they are placed on points of the body. The sound vibration travels through the body, assisting in relaxation and healing. People often ask me how I got into Chinese medicine and acupuncture, so here goes. When I was three years old I had heart surgery to correct a defect I was born with. A formidable event at any age, this early life event influenced me a great deal, so much so that I thought I wanted to become a heart surgeon when I grew up. Eventually I fully understood what that would involve while I also found myself drawn to alternative types of medicine and healing. In college I followed my mother’s footsteps into philosophy and enjoyed exploring thought and humanity from that perspective. I attended UNH for two years where I lived with some avid rock-climbers who were also into crystals. That was the turning point for me, in some ways, as I dove into the world of crystal healing. My love of nature and connection to the Earth has gotten me through so much. Being connected to the natural world and geeking out on crystals led me to learn an energy healing system and develop a meditation practice. By that time, I had moved to the west coast, finished my undergrad work at Lewis and Clark College, tried being vegan, done some juice cleansing, went back to eating meat and discovered acupuncture. My profound experiences with acupuncture, combined with a persistent nagging pull to find my path towards a career in natural medicine led me to graduate school. I graduated with honors from the National University of Natural Medicine in Portland, Oregon where I had awesome teachers and extensive mentorship. I am nationally board certified in Chinese Herbology and Oriental Medicine from the NCCAOM and licensed in Vermont. Being back in the Northeast and closer to my family of origin is such a blessing. My husband and I love Vermont and are so glad we took the leap to come here. A little about how I practice: I am committed to creating a safer space for you to explore yourself, your relationship to your body and for you to discover more joy and magic in each day. I practice trauma informed care and believe in a weight inclusive way of being with folks. I believe that our bodies have innate wisdom which can be awoken to increase wellness. I strive to practice non-judgement and to be present with an open heart each day while being my authentic self (this is all a work in progress, for sure). I look forward to exploring with you! Located in the carriage house! Enter in the front door. Parking to left of the carriage house behind main building.